the basic infrastructure and repair typhoon damage. Our Mandalas are dedicated to them! 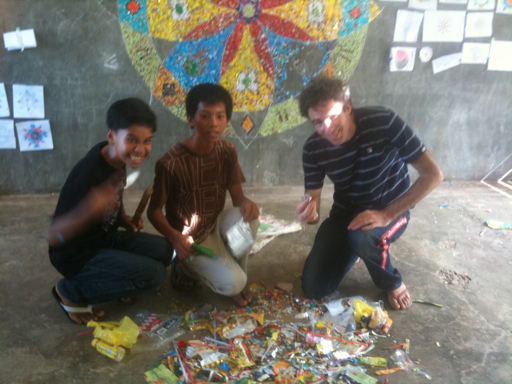 I've been sharing my recent work with a crazy remote and challenged school in the mountains of Paracelis, Philipinnes. The school serves the isolated Ga'dan tribe. The teachers make a 2 hour commute over rough road, then stay the week in the two room school-- the other four rooms were recently destroyed by a Typhoon. Despite their sparse and challenging situation, the students are so keen to learn and connect. When I did my little customary spiel on Canada, they we're full of questions. Do you grow rice? How do you get married? What foods do you eat? What do they youth do for fun? Etc. These students come from such a vastly different culture. It struck me that they would make fantastic pen pals for students of the same age back in Canada. I asked them what they thought of the idea. They loved it! So, we wrote some letters! 122 to be precise. Each letter begins "Dear Mystery Friend". The student introduces themselves and where they are from. I personally love to write letters, so I shared some techniques with them-- including some flowers or leaves, making a little drawing or two, custom made envelopes. 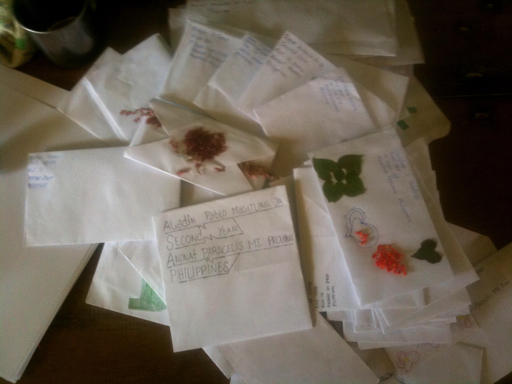 The result: We've got 122 amazing letters just waiting for mystery friends! Anyone out there have a class or bunch of youth who would be interested in old-fashioned-pen-pals? The kids were aged 9-16. If so, drop me a line! I am finally getting the hang of being a Jedi. It's easy actually. It's all about flowing with the force. You flow, the force does the rest. In this way I showed up to the Gag'gad'dumpay Youth conference on the Environment with Irene and several other teachers last week. It took us nine hours to get there. I had just traveled six hours from my art exhibit in Baguio, and didn't have time to even get home to Sagada, let alone prepare for the conference. The conference was being convened to give the youth of the Paracelis, a poor and isolated are of the Philipinnes, a chance to be empowered on environmental and population issues. Irene, from the department of Education had seen what I had done in the mandalas I done in the past and wanted me to do another. And so, with barely even having a chance to talk to Irene, nor to get a supply of art materials, we arrived. One hundred and fifty youth greeted us and a dozen teachers. I was the only foreigner and everyone was expecting some sort of miracle from me! I must admit a bit of panic and frustration overcame me. I was there with nothing! But, that folks, is how a Jedi works. He shows up with nothing but faith, openness and creativity. The openness and the creativity being one and the same. And sure enough, everything fell into place. Magically. First, I discovered a classroom with the most lusciously bare wall you can imagine. It's alluring blankness enchanted me at first sight. My eyes widdened and my heart began to pound-- it was perfect! And thus the weekend co-creation began. Sure enough the students and I found lots of colorful garbage. We began to cut it up into little squares. And then, with paper and pen and a couple boxes of crayons, we all made mandala sketches on paper (imagine sharing 5 boxes of crayons crayons with 60 kids! There were only 7 crayons a box and I felt slightly biblical as I broke them and passed them around to all). Even with only seven boxes of crayons, these paper sketches turned out amazing. We then mined them for symbols and patterns, we used the most prevalent to sketch with chalk on the beautiful blank wall. With the pattern established we said a little prayer to bless the mandala and the process. 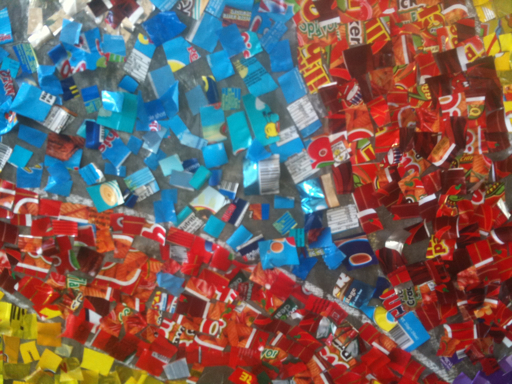 The youngest began, then the oldest, then everyone joined in adding pieces to the blossoming mandala of garbage. And... a week later, with the help of another class of highschool students, we finished it off. Tad aaa! I was in Paracelis last week for the Gag-gag-Dumpay youth Conference. 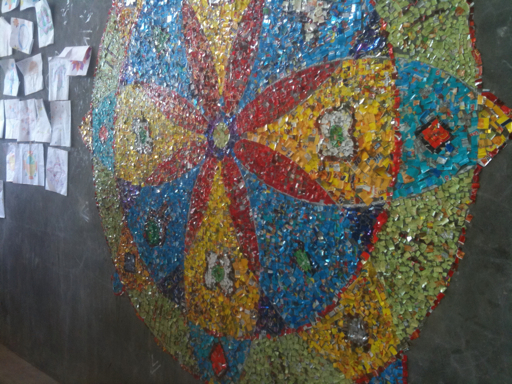 Here with 150 youth at the environmental summit, we began a mosaic mandala-- out of trash! 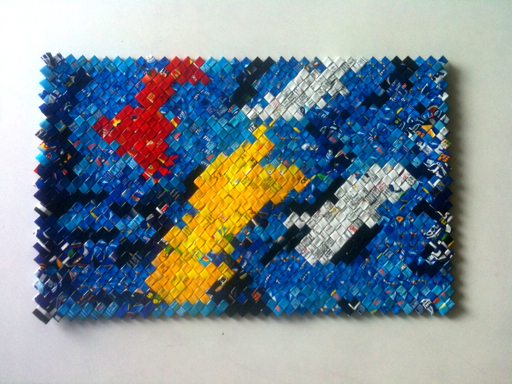 Here it is unfolding, piece by piece of colorful-cut-up-sachets at-a-time. I am as surprised as you and everyone else how people it is turning out to be! 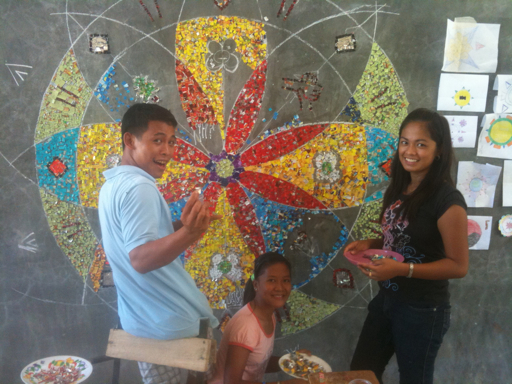 I've been making mandalas from a crazy remote and challenged school in the mountains of Paracelis, Philipinnes. The school serves the isolated Ga'dan tribe. The teachers make a 2 hour commute over rough road, then stay the week in the two room school-- the other four rooms were recently destroyed by a Typhoon. The coffee and food is cooked over a wood fire in their plank and bamboo living quarters. The school has one ball and one computer for 122 students, yet boy are they eager to learn! I don't think I have taught at a school yet were I was received by a cheering crowd, so many smiles and so much grattitude by both the teachers... and the students! 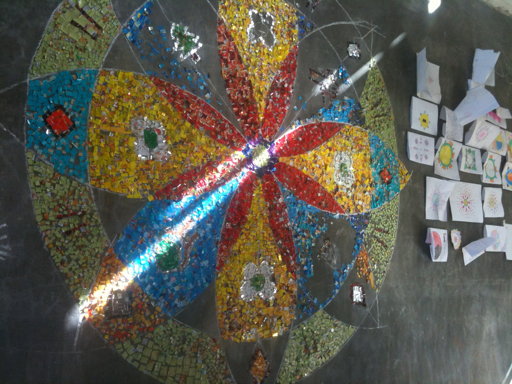 Despite the complete lack of art supplies... we all worked together and made the most amazing mandalas ever! 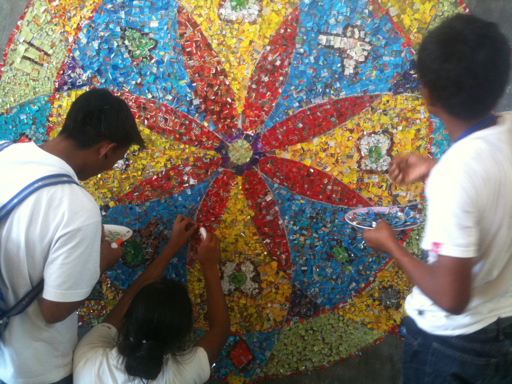 The students scavagenged garbage, leaves and grass to make the most original and beautiful mosaic mandalas. The teachers themselves we're dazzled. When I arrived they asked me what art supplies I was bringing with me. I had just smiled. "We didn't think you could actually coordinate 120 kids at once, let alone have them make such beautiful art"
I think that was my biggest reward-- to see the kids inspired to new heights by the creative and collaborative challenge. Once I am back in civilization and I can connect to WIFI I will post pics. Last week, the weaving women and I finished off all of prototype pieces. 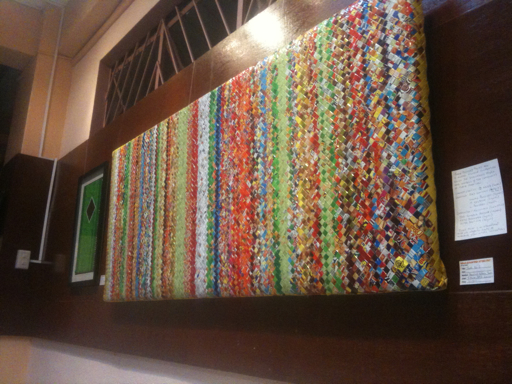 With the help of framers, carpenters and friends, I was able to make it to Baguio with the art pieces for the show. It was a great example of existential determinism manifesting magically. Traditionally, my art has been about my personal culture and my work. 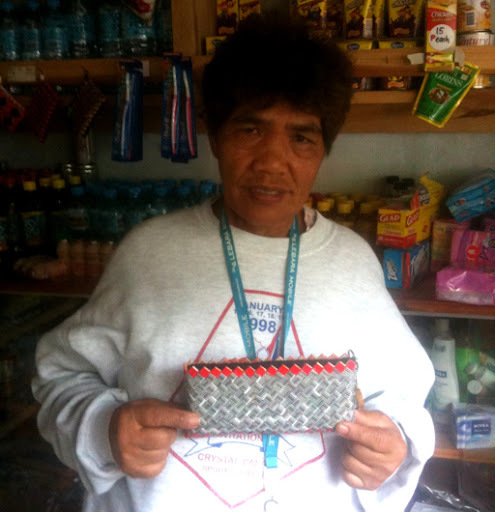 This time, it's about the work and collaboration of women (household and family supporters) in different villages and their indigenous culture. The work all came together beautifully. But, by the time all the art was ready to leave Sagada I had missed the last bus to Baguio. Jed helped me pack it all up and I left town with a massive 6 foot long roll on my shoulder. I ended up hiking 3 or 4 kilometers this way until a gold mining truck picked me up. He was heading straight to Baguio! We made it late that night, and the next day I got all the art setup. 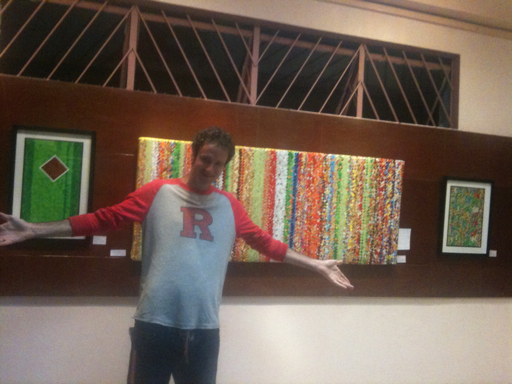 The evening opening featured my work and that of five other cordillera artists. The show featured the leading edge Igorot artistic explorers of a region already immensely rich in culture. What an honor to be part of it! Rebekah, an American friend who made it to the opening, gave me a particularly profound compliment after the show. She said that in all her travels she had never met someone doing what I was doing. Usually a 'foreigner' experiences a culture. Here I am honored with a position to help shape it, to take and work with an exceptionally good part of the culture, use my skills and connections, and take it (and the other artists) to a whole new level. It's kinda like when you're watching the tide on the beach. The waves come in to a certain distance. Then, sometimes, one, two, even three waves happen to coincide and... Whoosh... They propel each in so much further soaking your socks and shoes! Like that. But the waves are the best elements of different cultures on our planet. "One man's trash is anothers Treasure." So the saying goes. But perhaps we can make that a little more relevant... "One man's trash is a women's treasure." 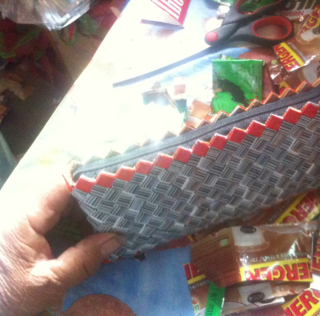 Here in the Northern aphilippines, the older women use a splendid technique to weave the trash from chips and sachets into all sorts of bags and things. 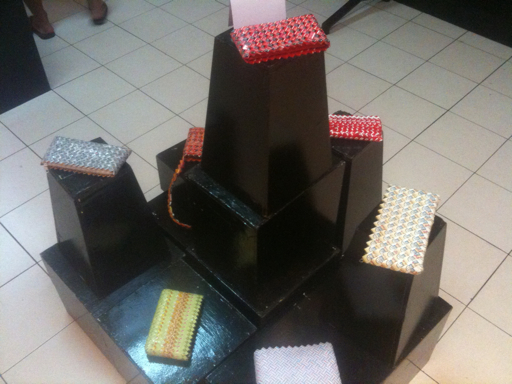 They take discarded sachets and wrappers, diligently clean and fold them, then weave them up. I've been working hard with four different women to apply modern aesthetics to technique and on improving their designs and taking sales from Canada, Spain and Holland. We're working hard towards an exhibit in Baguio on the 9th. 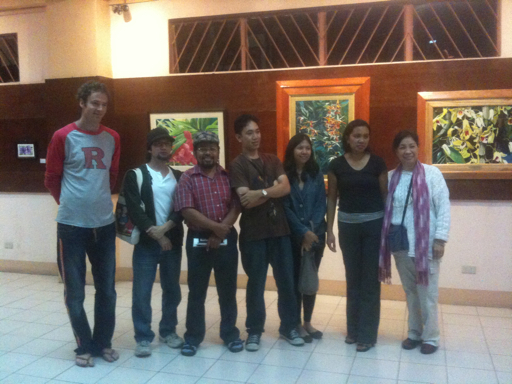 My friend Victor has invited me to show at the Baguio Museum with five other Philipino artists. I am very excited and honored. So too are Brenda and Stanpi, the weavers! Above is the latest design. My dream is to show much much larger pieces at an exhibition in Berlin. In the meanwhile I am working hard with my local buddy Jed, who has a dream of segregated waste baskets throughout Sagada. We'll soon be running out of garbage to weave unless we call get a recycling system going. Jed's baskets would get that the trash right to the ladies, so they can turn it I to treasure!